Plants densely cespitose; rhizome internodes 0.8-6.4 mm, 1.2-2.2 mm thick. Culms purple-red to 4.8-8.1 cm at base, 24-53 cm; vegetative shoots 28-49 cm, 0.5-1.3 times as tall as culms. Leaves green, widest blades 2.1-4 mm wide. Inflorescences 13-38 cm, 0.77-0.96 of culm height; internode between proximalmost scales in proximalmost spike 1.7-2.9 mm; internode between distal lateral spikes (1.6-)3.4-15.2 cm, longest internode between distal lateral spikes (5.3-)8.8-15.2 cm; longest peduncle per plant of terminal lateral spikes (2.2-)5.1-10.4 cm; proximal bract sheaths tight, hyaline band of sheath front with apex usually truncate or concave, occasionally convex, elongated to 2.2(-5) mm beyond apex; ligules 4-4.9(-9.6) mm; blades uniformly green, bract blade of distalmost lateral spike slightly exceeding or exceeded by terminal spike, longest bract blade of distalmost lateral spike 3.9-11 cm. Spikes 4-5, usually separate or the distal 2(-3) overlapping; lateral spikes pistillate, with 3-12 perigynia, longest per plant with 6-12, 5-21 × 3.2-4.1 mm, ratio of longest lateral spike (in mm) to flower number = 1.8-2.1; terminal spike 16-32 × 1.9-2.5 mm, longest per plant 17-36 mm, exceeding distalmost lateral spike. Pistillate scales 3-4.6 × 1.6-2 mm, body 1.6-2.6 mm, midrib prolonged as awn 1.1-2.5 mm. Staminate scales 4.3-5 × 1.4-1.8 mm, apex usually acute, occasionally obtuse, awnless. Perigynia distichously imbricate, prominently 53-64-veined, narrowly obovate or narrowly oblong in outline, 3.8-4.9 × 1.4-1.7 mm, (2.4-) 2.5-3.1 times as long as wide, 1.7-2 times as long as achene bodies, base gradually tapered, apex gradually tapered; beak absent or straight, 0-0.4 mm, 0-11% of perigynium length. Achenes 2.6-3.5 × 1.3-1.6 mm, tightly enveloped by perigynia, base abruptly contracted, apex abruptly contracted; stipe 0.2-0.6 mm; body 2.1-2.7 mm; beak straight, 0.1-0.4(-1.5) mm. Fruiting spring. 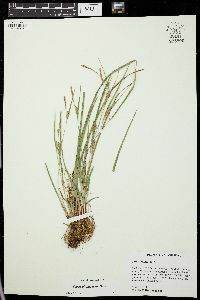 Mesic deciduous forests, in sandy loams, usually on upper portions of flood plains and adjacent slopes; of conservation concern; 40-100 m; Ala., Fla., Ga. Carex thornei is endemic to the drainage of the lower Chattahoochee, lower Flint, and upper Apalachicola rivers. 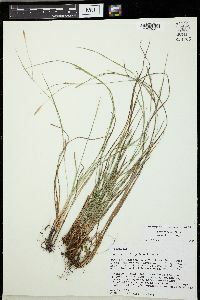 It frequently occurs with C. abscondita and C. basiantha.